Amplitude is defined as the distance between the tip crest of the wave to the rest position of the wave. With Amplitude modulation, the amplitude of the carrier wave varies, while the frequency remains constant. Frequency modulation is the encoding of information in a carrier wave by varying the instantaneous frequency of the wave. FM has better noise (RFI) rejection than AM, making it the more popular choice for broadcasting. Most ham operators in the HF radio spectrum efficiently use Sideband, a band of frequencies higher than or lower than the carrier frequency, containing power as a result of the modulation process. 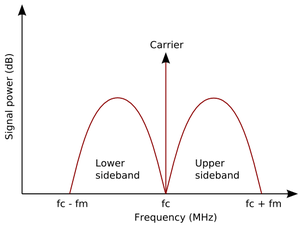 The signal components above the carrier frequency constitute the upper sideband (USB), and those below the carrier frequency constitute the lower sideband (LSB). In SSB, the carrier is suppressed, significantly reducing the electrical power (by up to 12 dB) without affecting the information in the sideband. What about Mobile phone and Wi-Fi signals? What is the engineering involved with these modes?